“The proportions just never seemed right to me,” he continued. But like a 911 piloted with a hesitant foot, the man sitting across the table unexpectedly came around — indeed, in his pocket rested the keys to of one of the most significant ‘elfers’ on Canadian roads. Meeting him for the first time, Faisal comes across as a quiet but enormously friendly man. A chemical engineer by vocation, he matches a sharp intellect with a subtle flair and an admirable modesty. A few grey hairs and a sensible station wagon lend an air of upright seriousness, but turn the key on a conversation about motoring and a warm smile revs into unconstrained enthusiasm for things that go. His former views on Porsches may border on blasphemous, but Faisal is an eager-footed petrolhead to the core. In all fairness, I can understand his reservations: simply put, the 911 is weird. The ‘misplaced’ engine and steadfast commitment to eccentricity contravene many basic tenets of modern automotive design, at once targeting conservative enthusiasts and fickle everyday consumers. It is a paradoxical lineage whose every advancement can alienate and excite in equal measure; outsiders mock generational sameness as unimaginative and purists the most minor variations as perversions of formula, yet none will decline an outreached keyring with a Porsche fob. In 2013, BBC Top Gear ran a seven-minute piece that briefly discussed this phenomenon. They seemed confident that they had found an answer, however, as the brainchild of a small California workshop came onscreen. It was here that our friend Faisal was stirred by a Porsche as he never had been before. “I hit pause at the end of the segment and checked the time,” Faisal recounts. “It was still early evening in Toronto, so I figured they couldn’t have left the shop yet.” Sure enough, company founder Rob Dickinson picked up. Singer Vehicle Design is a small Los Angeles shop specializing in the ‘reimagining’ of the Porsche 911. 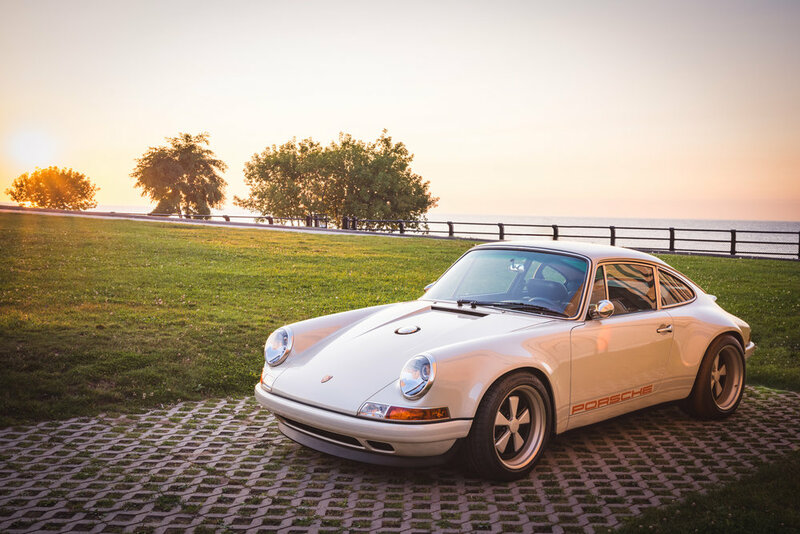 Developed from the foundations of the 964, the ‘Porsche 911 Reimagined by Singer’ distils the best of almost six decades of ‘elfers’ into a sort of air-cooled highlight reel. 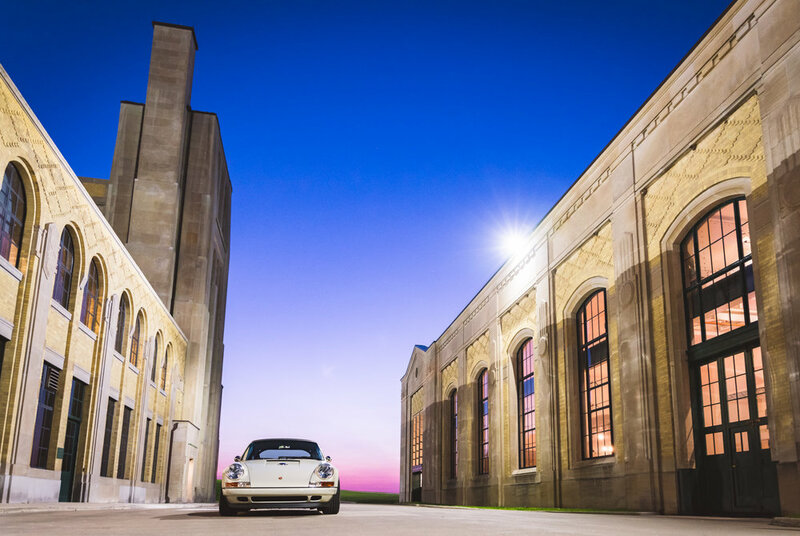 Drawing on cues from the 901 and carrying straight through to the 993, the revitalized car brings a tremendous history of technical and design innovation together inside a distinctly personal package. Since starting with the Cosworth-tuned 3.8L, Singer has come to offer a 4.0L built by Ed Pink Racing and is now touting a 500hp monster developed in partnership with Williams. Over the course of their first hour-and-a-half, Rob paid close attention to Faisal’s likes, tastes, and interests. “We just geeked out really. I had called about a Porsche, but we mostly ended up talking about my Alfaholics GT Junior build.” Two months later, a donor car was on the ground and ready for prep by the Singer team in Los Angeles. Before diving in, however, they first had to decide on a base colour. Though Faisal already had a general idea of what he wanted to do, Rob encouraged him to take his time and consider everything while they started dismantling the donor 964. Dickinson suggested “paying attention to things like mannequins and storefronts for inspiration,” and then to develop a palette around tones and hues that truly captivated the eye. Ironically enough, it was a commemorative 50th Anniversary Edition 911 that provided the decisive influence for this longtime Porsche skeptic’s build. Zuffenhausen’s creamy Geyser Grey Metallic was selected for the base, with accenting decals and brakes to be finished in Rob’s signature orange. The vast creative potential of the interior made for a challenging process, but a flight out to California (one of an eventual five) and an explosion of leather swatches across the Singer mezzanine eventually yielded a palette of five impactful tones. 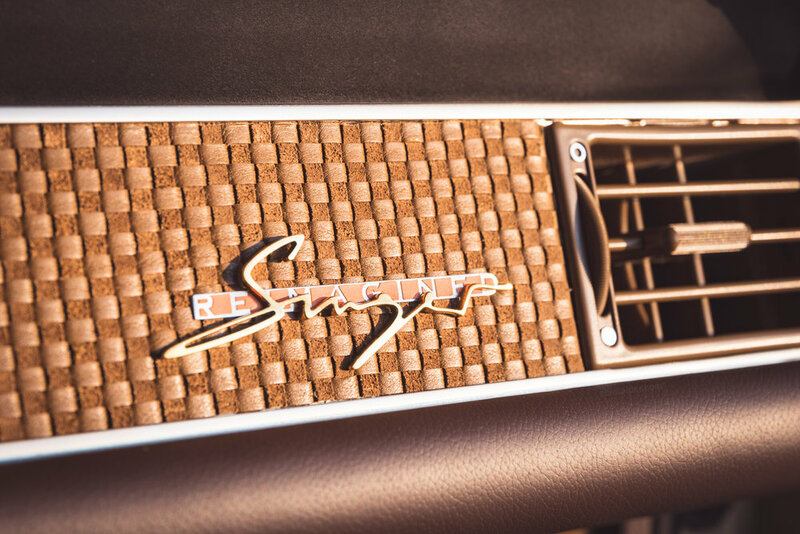 At more than 4,000 working-hours per vehicle, a Singer restoration is far more than just a wide-bodied chop-and-rivet job. Singer’s bodies are sculpted from lightweight carbon fibre and fitted with custom-designed Hella fixtures. A roll-bar (or optional full cage) stands firmly in the rear, reassuring the driver that regardless of cosmetic accoutrements, this is a solid vehicle with a very specific purpose. 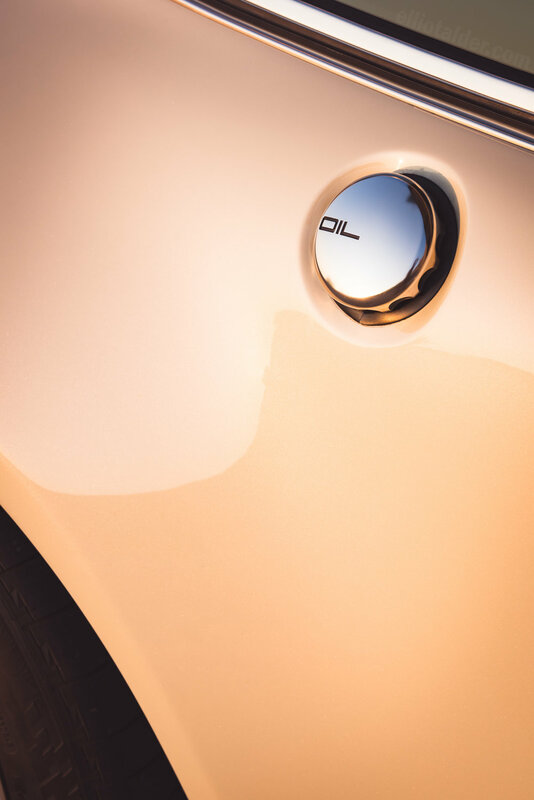 A machined aluminum fuel cap is placed in the center of the bonnet, and oil top-ups can be performed from another exterior filler located on the right rear fender. At the rear, an active rear wing maintains the smooth profile of the 911, then deploys to increase cooling and downforce while explicitly evoking the classic RS ducktail. For all of the modern technology at work beneath the surface, this 911 remains an unmistakably analog monster: apart from the slight comfort afforded by ABS, ‘driver assists’ are effectively limited to a set of Brembo ‘Big Brakes’ and a steering wheel. A stiff Ohlins suspension setup and Porsche’s classic trailing arms make for a wild ride, and Faisal chuckles as he recounts how he discovered why 911 drivers don’t lift the throttle in the corners. With no traction control steadying the power and rear-biased weight of its 360 horsepower Cosworth 3.8, the reimagined car looks for opportunities to throw its tail just as a factory 911 ought to. Rounding this out, the soft smell of fuel wafting along with the exhaust’s flaming pops and ferocious growl is nothing short of intoxicating. 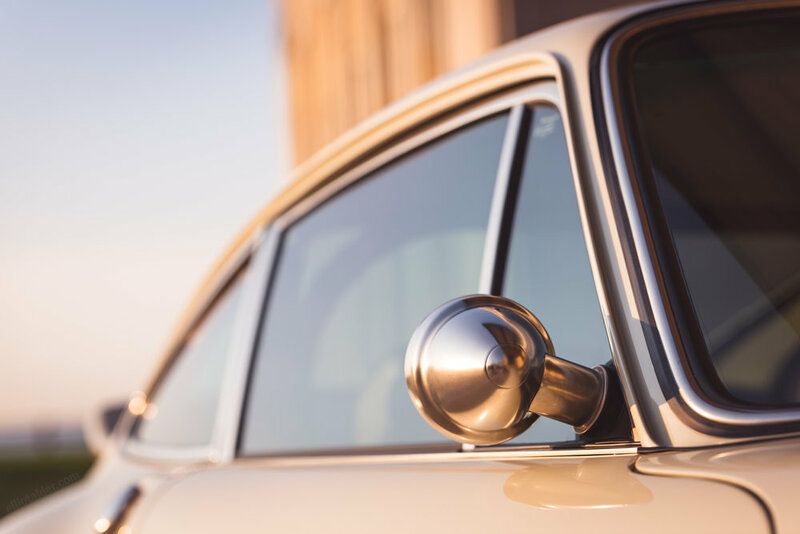 Perhaps most importantly though, the doors open with Porsche’s firm Teutonic ‘clack’ — and when they do, they reveal an interior unlike any other. ‘Bespoke’ feels like an inappropriately bourgeois word for the cockpit of such a violent machine, but there really is no truer way of describing the elegant detail of a Singer-reimagined interior. Sinking into the retro-inspired Recaro low-backed seats, one finds themselves cocooned in fine leather with tasteful metallic details throughout. Fine leather straps serve as lightweight interior door handles, while the textured vinyl of days passed returns as a hand-prepared leather weave that extends from the seats to the dash and door panels. Removing the center console opens up the front footwells, making the car feel larger and minimizing distraction from the six-speed stick mounted on the center tunnel. Above, a modern Becker radio is subtly blended into the dash with a subwoofer (disguised as a cushion) ready to be slotted in and out of the rear seat. Finally, full race harnesses are folded and ready should the need for a more serious thrashing arise. The finished product is a sight to behold. 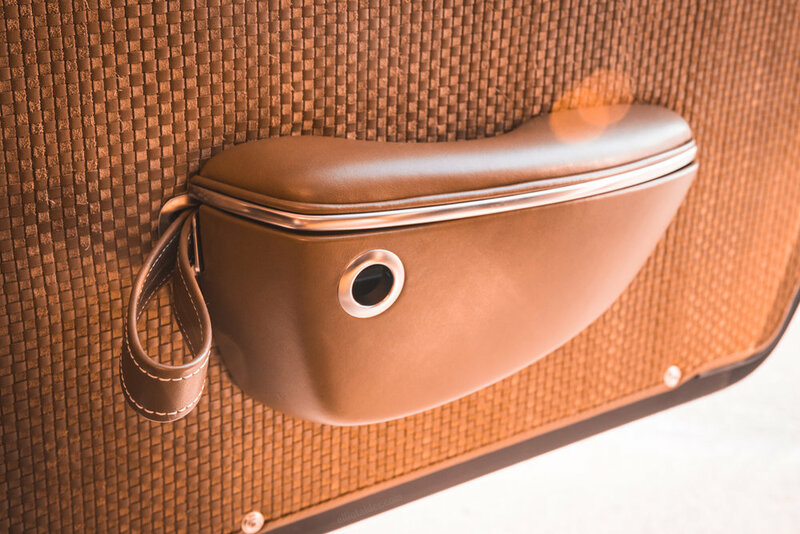 The dash face and seats are textured with a cognac leather-suede weave punctuated with grommets and nickel-plated fittings. An ivory headliner keeps the cockpit bright and open. The upper dash, steering wheel, and interior roll bar are wrapped in a deep tobacco to minimize distraction and glare, while the ‘jacuzzi’ — so-called for its undulating form beneath the seats — is lined with bone-coloured suede. Finally, the tachometer face and driving gloves (kept on the dash and at the ready, of course) balance the brown and orange hues with a subtle touch of NATO Green. Number 25, known as ‘The Toronto Car’ is far from the most ostentatious vehicle to leave Dickinson’s shop, but many of its details are what make the Toronto Car so important. Apart from being the second-last car powered by Singer & Cosworth’s original 3.8L flat six, Faisal and Rob “really pushed the envelope” in terms of what the California outfit had done — and what else they discovered they were capable of. Until that point, certain components had simply been taken for granted as standard fixtures. Inspired by Rob, however, Faisal’s creative enthusiasm challenged the team to explore new avenues. More than just the car’s shape as a whole, previously-unconsidered details were identified as candidates for their own reimaginings. Seemingly pedestrian components such as the standard black reflector housings, for instance, were singled out for nickel plating to better complement the exterior paint. A re-covering of the classic Prototipo steering wheel had never actually been done before, yet made perfect sense to complete the car’s retro colour scheme. Even carpet seemed too mundane, so the floors were lined with eye-catching suede as pads of marine leather protect wear spots from overzealous driving shoes. Faisal keeps himself composed as we talk about his Reimagined 964, but the glow in his face betrays a genuine boyish excitement. Looking back on the yearlong build process as well as into the future, he can’t find a single negative thing to say. “[Singer was] excellent the whole way through and has been with supporting the vehicle from the moment that it left their shop floor,” Faisal explains. With every revision he receives an overnight package with updated components free-of-charge. Being one of their earlier restorations meant that there were some kinks to iron out, but Faisal’s efforts to drive and enjoy the car wherever possible have helped to identify and remedy many little issues. His observations during and since the project have impacted every vehicle to roll out since, and he is proud to say that #25 continues to serve as an informal R&D platform for the Singer team. Whether this reimagined 911 is a purist’s dream or worst nightmare, there is no mistaking one fact: it is one hell of a Porsche. The Toronto Singer is a celebration of a venerable history, but it is also a part of the first chapter in an exciting new one. Dickinson and his team have sculpted something truly special from the ‘neunelfer’s unique juxtaposition of futurism and anachronism, and it will be exciting to see what else their innovative hands reimagine in the years to come.